Rainy day bento for today. I think I was kind of hoping today would be raining after a hot day yesterday. At least it is raining in my bento ... The green frog was made from green and yellow egg sheets, the eyes part was from kamaboko, cheek from red part of crab stick, and nori. Rain drops were made of chayote and I used spinach leaf & spinach stem for the umbrella. I was about to use daikon for the rain drops but forgot I didn't have any left in my fridge. Since the only transparent veggie in my fridge was chayote, so I used it to make the rain drops. Inside the other tier box : strawberries, kumquats, sweet corns, spinach tamagoyaki, stir fry Chinese cabbage, and sauteed prawns with sweet soy sauce and onion. My spinach tamagoyaki was a little bit brownish instead of yellow because I put soy sauce when mixed the egg. I didn't put sugar and mirin this time but just soy sauce and a little bit of salt. So cute kero kero in this lime green box! Love his lily pad umbrella. Hope for rain for you! @Lunch Buckets : Thanks a lot for your sweet comment! OoooH!!! Such a cute little froggy! How did you get the green on the egg sheet? What ingredients did you use??? Oh Lia, this is so cute! How I wish I am under that leaf too...but please don't eat me..hahaa..
so cute! Fits so nicely to our weather here (rainy .. almost everyday)..
Aw, what a cute little rain frog! I really like the idea of spinach tamogoyaki. Do you mix the spinach in with the egg or put it on top of the first/second layer when cooking? you're so funny lia, wishing for rain, usually people wish the reverse! i like the rain too, though; nice break from the heat. your rainy frog scene is adorable, and the spinach-salty-soy tamagoyaki sounds delicious! You are amazing!!! Absolutely love it!! Perfect bento!! I love this Lia, especially the cute froggie. Everything is soooo detail. I am also into "Bentoing", but not as "pro" as you yet. haha! 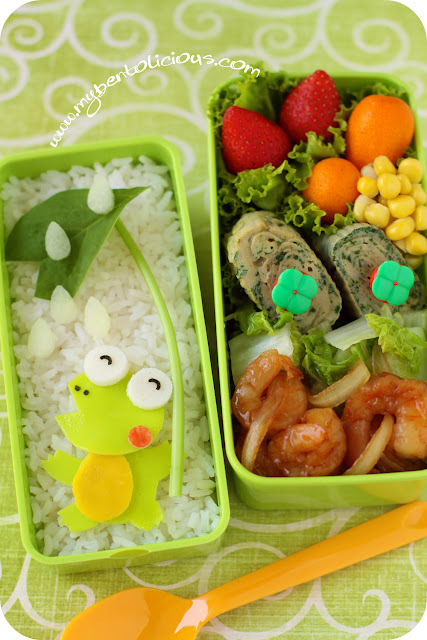 How do you make those cute cartoon characters in your bento? @tatabonita : Hi Tata! I don't mind to switch with you, I do love rain as long as it doesn't cause flood. Ah your favorite color again, so I think the frog will be your buddy then hehehe ... Thanks a lot Ta! Bento LOVE! Utterly charming, your style is wonderful and makes me smile with joy, Lia! @bentobird : Aww ... Thanks a lot Jenn for your sweet comment!